We look forward to welcoming you to our property soon. From Marshall Place, turn into Nelson Street and take the first left (before bridge) into the lane at the rear of the property then to our car park or marked bays. Please do not park in any other spaces belonging to adjacent properties. Please note: Parking is at the owners risk. The Townhouse cannot accept responsibility for any loss to, or damage from, vehicles. We are easily accessed from the M9 and M90 motorways and the A9 Inverness road. Once arriving in Perth City Centre and Marshall Place drive into Nelson Street, then take the next left which will take you into the lane leading to our car park. From Marshall Place, turn into Nelson Street and take the first left (before bridge) into The Mews to our car park or marked bays. Please do not park in any other spaces belonging to adjacent properties. Perth can be reached by a network of fast and reliable coach services. In addition, local bus operators provide frequent links to Perth from most local towns. For details contact: Citylink, Megabus, Traveline, Stagecoach. Turn left outside the Bus Station, follow the road under the railway bridge. Straight on for 200 metres, past the church, and then look for the discrete ‘The Townhouse’ sign at no.17. Perth Railway Station is a short walk from the City Centre. There are regular services to and from Stirling, Dundee and Pitlochry, with a journey time of around 30 minutes. Direct trains to and from Edinburgh run at approximately two hourly intervals. From Edinburgh, the journey takes an hour and 25 minutes. The direct train to Perth from Glasgow, runs hourly from Queen Street and takes around an hour. Turn right outside the Railway Station, follow the road under the railway bridge into Marshall Place. 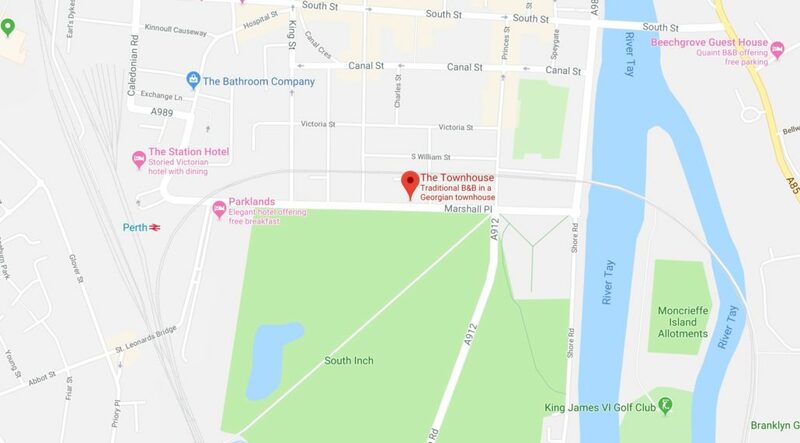 Situated overlooking the South Inch Park, only minutes away from the City Centre, bus and train stations The Townhouse is an ideal place to stay, whether it be for a brief overnight visit or a prolonged stay to visit the surrounding countryside and highlands.